First off, you might want to study the various metric prefixes. 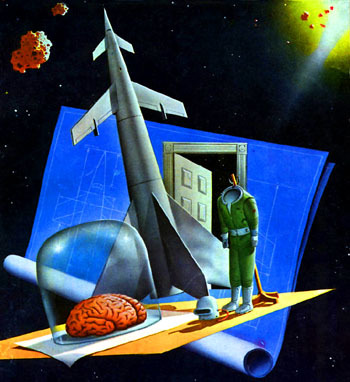 SF novels like to alter things that are taken for granted, to remind the reader that they are reading science fiction (though it is a sign of a pathetic SF story if you can change the entire background to a conventional setting without affecting the story). A different system of measurements is a quick and easy addition. Remember how the original Battlestar Galactica had the crew taking about times and distances in terms of microns, centons, and yarens. Here are some exotic measuring systems to add that air of verisimilitude. A fairly standard trick is altering the "year one" of the calendar. Popular choices are 1945 (the first detonation of a nuclear weapon), 1957 (the year Sputnik went up, the first man-made object boosted into orbit), 1961 (the year Yuri Gagarin became the first man in space), and 1969 (the year Neil Armstrong became the first man to set foot on an extraterrestrial object). Extrasolar colonies tend to set year one to the year the colony was established, the year of "first landing." So if the novel adopts the Armstrong standard, a story set in the Gregorian year 2010 would be year 41 of the Space Age. Authors who want to strike a more secular tone will use "CE" and "BCE" instead of "AD" and "BC", especially in the academic world. Or avoid the matter entirely, say by using a 1945-based year-one with a flashy title like "Atomic Era." An actual real live problem is the fact that measuring units such as years, days, and seasons are very closely tied to Terra. They have reduced relevance for those living on other planets, and practically no relevance to Belters and others living in deep space. In Heinlein's Podkayne of Mars the main character emphasizes the fact the novel is science fiction by mentioning that she is about eight years old and almost old enough to marry. However, she lives on Mars, which has a longer year than Terra. So while she is 8 Martian years old, she is about 15 Terran years old. This becomes a serious problem when interplanetary companies have to start coping with things like periodic fiscal years, tax periods, and rental durations when they have branch offices on several planets. Corporations with their headquarters based in the United States have to pay their taxes every April 15th, and the branches on other planets will have to deal with the fact that particular day does not correspond to the local month or date. Commonly science fiction writers take one Terran year and dub it a "Galactic Standard Year", at least for planets colonized by humans. The writers usually pointedly have some character say such and such an event happened a few Tau Ceti IV years back, and another character irately asks "how many years is that in Galactic Standard Years, you moron?" This is to rub the reader's nose in the fact that this is a science fiction novel and they are not in Kansas any more. And things can become real ugly with religious schisms over which day to celebrate specific holy days. It can seem a bit illogical to observe a holy day based on the start of spring, when on your planet that particular Terran day will drift through the planet year from season to season. On a smaller scale you can guarantee that the length of an extraterrestrial planet's day is not going to be 24 hours. Which is going to really screw up the colonist's circadian rhythm. You can either desynchronize the 24 hour clock from the planet's day and night cycle, or divide the planet day into 24 divisions and deal with the fact that the first few generations will be suffering from permanent jet lag. In theory later generations of colonists will eventually adapt their circadian rhythm to the planet, unless the planet day is too extreme. 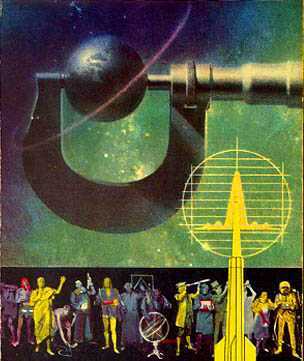 Some science fiction novels have people not using hours, but instead using ship watch periods to measure time. Usually one "watch" is four Terran hours, with six watches in a Terran day of 24 Terran hours. Sometimes you'll see the term "ship-day", meaning Terran Standard Day as understood by a starship crewman. "One thing," Desoix said, looking out the window even though the initial spray cloaked the view. "Money's no problem here. Any banking booth can access Hammer's account and probably your account back home if it's got a respondent on one of the big worlds. Perfectly up to date. But, ah, don't talk to anybody here about religion, all right?" He met Tyl's calm eyes. "No matter how well you know them, you don't know them that well. Here. And don't go out except wearing your uniform. They don't bother soldiers, especially mercs; but somebody might make a mistake if you were in civilian clothes." "What's the problem?" Tyl asked calmly. From what he'd read, the battle lines on Bamberia were pretty clearly drawn. The planetary government was centered on Continent One—wealthy and very centralized, because the Pink River drained most of the arable land on the continent. All the uniquely flavorful Bamberg tobacco could be barged at minimal cost to Bamberg City and loaded in bulk onto starships. Desoix laughed without even attempting to make the sound humorous. "Well," he said, "do you know when Easter is?" "Huh?" said Tyl. "My family wasn't, you know, real religious … and anyway, do you mean on Earth or here or where?" "That's the question, isn't it?" Desoix answered, glancing around the empty cabin just to be sure there couldn't be a local listening to him. "Some folks here," he continued, "figure Easter according to Earth-standard days. You can tell them because they've always got something red in their clothing, a cap or a ribbon around their sleeve if nothing else. And the folks that say, 'We're on Bamberia so God meant us to use Bamberg days to figure his calendar … well, they wear black." "And the people who wear cloaks, black or red," Desoix concluded. "Make sure they know you're a soldier. Because they'd just as soon knock your head in as that of any policeman or citizen—but they won't, because they know that killing soldiers gets expensive fast." Tyl shook his head. "I'd say I didn't believe it," he said with the comfortable superiority of somebody commenting on foolishness to which he doesn't subscribe. "But sure, it's no screwier than a lot of places. People don't need a reason to have problems, they make their own." "And they hire us," agreed Desoix. As for the populace, its members knocked in each other's heads depending on what each was wearing that day. Just normal politics, was all. Normal for places that hired the United Defense Batteries and other mercenary regiments, at any rate. Two drivers, one with a load of produce and the other carrying hand bags, were snarling. Three black-cloaked toughs jumped the driver with the red headband, knocked him down, and linked arms in a circle about the victim so that they could all three put the boot in. At least a dozen thugs in red coalesced from nowhere around the fight. It grew like a crystal in a supersaturated solution of hate. The police had their stunners out and were radioing for help, but they kept their distance. The toughs wore body armor beneath their cloaks, and Desoix heard the slam of at least one slug-throwing pistol from the ruck. "Say," asked a blond private Desoix couldn't call by name until his eye caught stenciling on the fellow's helmet: Karsov. "Is there any chance we're going to move, sir? Farther away from all this? It gets worse every day." "What's …" Desoix began with a frown, but he turned to view the riot again before he finished the question—and then he didn't have to finish it. The riot that Desoix had put out of his mind by steely control had expanded like mold on bread while he walked the three hundred meters to the shelter of his gun and its crew. There must have been nearly a thousand people involved—many of them lay-folk with the misfortune of being caught in the middle, but at least half were the cloaked shock troops of the two Easter factions. Knives and metal bars flashed in the air. A shotgun thumped five times rapidly into a chorus of screams. A firebomb went off, spraying white trails of burning magnesium through the curtain of petroleum flames. Police aircars were hovering above the crowd on the thrust of their ducted fans while uniformed men hosed the brawlers indiscriminately with their needle stunners. One solution appears in Joan Vinge's The Outcasts of Heaven's Belt. In the Heaven's Belt system, there are no habitable planets, but zillions of mineral rich asteroids. That's where the people live. The only time unit is the Second (this is sometimes called Metric Time). 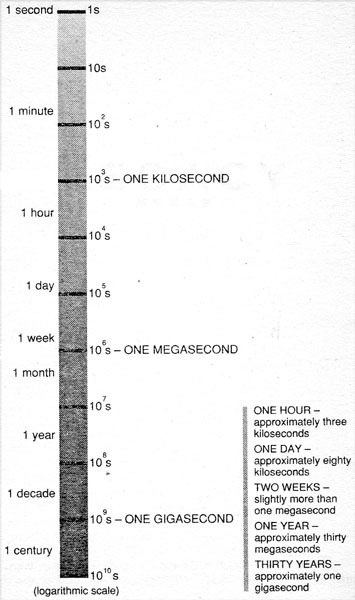 Three kiloseconds is about an hour, thirty megaseconds is about a year, you can read it on the chart above. It works regardless of the orbital period of the particular space habitat, you can calculate the duration between any two points in time with simple subtraction, it's great! This system is also used in Charles Stross' novel Accelerando. The following tables are from here. 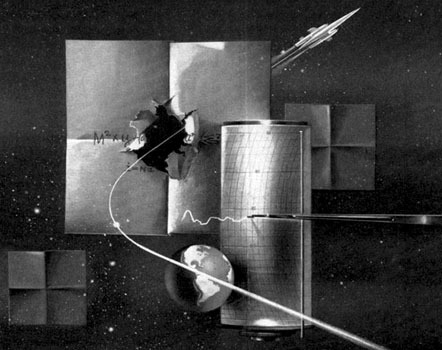 Vernor Vinge used the system in A Deepness In The Sky, also known as After Epoch Astronauticum. The zero point is set to Neil Armstrong's lunar walk, though when one does that the entire system starts looking suspiciously like Unix time, or POSIX time (Armstrong was in 1969, Unix time starts in 1970). Astronomers use a similar system that is based on days instead of seconds, the Julian Day calendar. There are no years, months or weeks, just days. Day zero is noon on January 1, 4713 BC. The date was chosen because it was the last time that three particular calendrical cycles converged. Ralph Buttigieg points out the fact that metric time does not work on the surface of a planet, due to our quaint way of measuring Longitude and celestial Right Ascension. Back in the age of sail, measuring lattitude was exceedingly easy to do with a sextant. Longitude was hard, because measuring it requires an accurate clock, since the determination depends upon measuring how far the Earth had rotated upon its axis. Unfortunately in those days, the only accurate clocks were based upon pendulums, which won't work in a ship pitching with the ocean waves. After the British fleet was wreaked in 1707 due to an error in longitude, the British government offered the longitude prize to the first person to devise an accurate shipboard method of determining longitude. John Harrison won the prize by inventing a spring based chronometer, though the British board of longitude tried to cheat him out of the prize money. Anyway, the point of all this is that longitude is measured in increments of the planetary day, which of course is of different lengths from planet to planet. Which puts a monkey wrench into plans of using some sort of universal metric time. There are other Decimal Time systems based on decimal Day units. 1 dekaday is about a week and a half, 1 centiday is about 14 minutes, and so on. The Swiss watchmaking company Swatch invented Swatch Internet Time, where the 24 hour day is divided up into 1000 parts called ".beats", each .beat being 1 minute and 26.4 seconds. This is actually an advertising gimmick. It is a rehash of the French decimal time system invented right after the French Revolution in the far futuristic year 1793. You can tell that it is intended for advertising purposes since out of all the systems invented in the last two hundred years, it is the only one that moves the prime meridian from Greenwich England to Swatch Headquarters. Swatch Internet Time faded away due to lack of interest, unsurprisingly. Of course, since all of these systems are based on the Terra-centered "Day" unit instead of the metric system "Second" unit, they are also much more parochial. A "Decimal Time" system is one where the various units are decimal fraction or multiples of each other (e.g., A decimal hour divided into 100 decimal minutes, each minute composed of 100 decimal seconds). A "Metric Time" system is a decimal time system with only one unit, and the everything is expressed by adding a metric prefix to that unit (e.g., second, kilosecond, megasecond). In addition, a metric unit only defines units of time interval (as does a stopwatch), not time of day (as does a clock). As an example, in Isaac Asimov's The Naked Sun, the Solarians use a decimal system. The Solarian hour as been divided into ten decads, each of which is divided into a hundred centads. This is not a metric system since the hour has not been divided into ten decihours, each of which is divided into a hundred millihours. There was a flawed attempt to create a decimal time system in the TV show Star Trek, the infamous "Stardates." They were created on the spur of the moment by Gene Roddenberry to avoid the problem of tying each episode to specific dates. The writers were told to just pick four digits at random. Pedantic Star Trek fans have been trying ever since to retcon a system that would explain the dates. Franz Joseph created his own system for Stardates: they are conventional Gregorian dates written in the form YYMM.DD (e.g., February 13, 1998 would be Stardate 9802.13). This is not considered canon. However, computer programmers have long noted the advantages of writing dates in odometer order. It simplifies sorting items by time. For example, if you have a series of files on your hard drive with names that start with a time stamp in YYMMDD form, when you examine that directory with the file names sorted alphabetically, the files will automatically be in chronological order. The flaw with Franz Joseph's system is that is it not clear if Stardate 9802.13 refers to February 13, 1998, February 13, 2098, February 13, 2198, February 13, 2298 and so on. In the Classic Battletech novels, particularly in the novel Tactics of Duty, a general solution to adapting to other planets was illustrated. 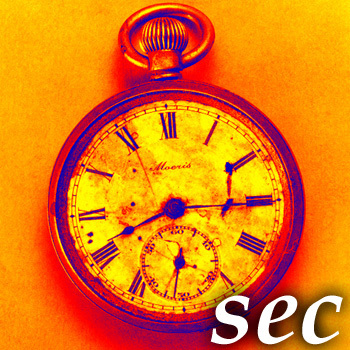 The length of a second remained the same, as did the number of seconds in a minute. but each planets day was divided up into twenty-four equal periods (sometimes with a twenty-fifth unequal period to make up the slack), which were the hour. So a fast rotating planet's hour would be less than Earth's, and a slow rotating planet's hour would be longer. Really odd worlds broke this system though, and Battletech has its share. 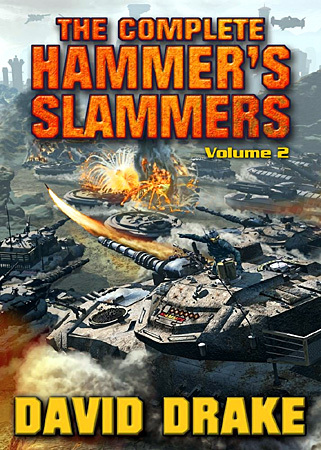 For example, in the novel Decision at Thunder Rift, the planet of Trellwan had a year about three local days long, due to the planet orbiting a dwarf star and being almost tidally locked. That planet used Terran hours and twenty-four hour days, but divided up its year into 'light' and 'dark' months, each half a local day long. Astronomers measure the distance between stars using parsecs, but science fiction writers almost always use light years. Parsecs are more scientific, but there you go. Multiply parsecs by 3.26 to get light years, divide light years by 3.26 to get parsecs. 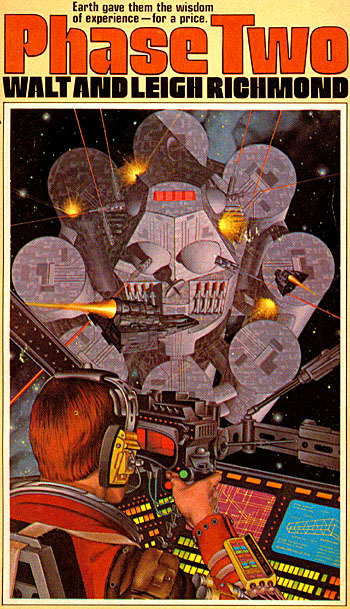 About the only place I've encountered parsecs in science fiction is in the novels of Isaac Asimov, the role playing game Traveller, and that stupid comment by Han Solo. Traveller uses parsecs because they are very close to the average distance between stars. This means if you are created a Traveller-style sub-sector 2D star map you can cram as many stars as possible into the map with a minimum of wasted hexagons. Strange sounding alternative metric units of length can be invented as well. 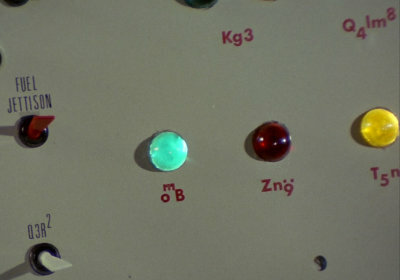 Erik Max Francis points out that the marvelously correct SI unit "megameters" makes an appearance in, of all places, the Americanized anime "Star Blazers". 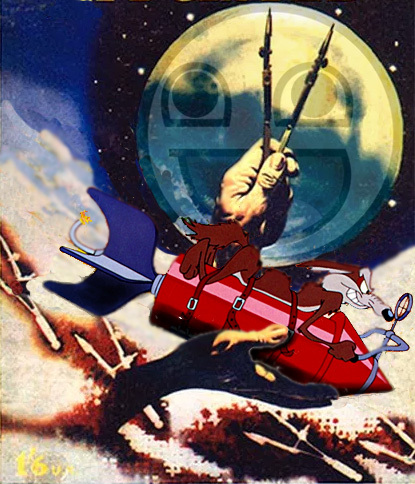 That anime was originally "Space Battleship Yamato", it is unclear if the term "megameters" appears in the original Japanese. One megameter is one thousand kilometers or about 620 miles. Another metric system of measure appears in the SF show Battlestar Galactica. This is slightly odd since they use the same units for time as well as distance. They could be related by a rate, such as the speed of light. This is what scientists use when they talk about light-seconds, light-minutes, light-days, and light-years. In Isaac Asimov's Foundation and Empire, Toran jumps his starship through hyperspace into the star system containing the planet Haven, then has to travel "several milli-microparsecs" to the planet. "Milli-micro-" is an obsolete term meaning "nano-" or 10-9. That would make one milli-microparsec about 31,000 kilometers, or about 1/13th the distance between Terra and Luna. 1 yoctoparsec (ypc) 0.000031 Millimeters Approximately the length of 160 bacteria laid end to end. Tactical display on the bridge of the Tempest. From the webcomic Outsider by Jim Francis. More here, here, here, and here. For a spacecraft pilot sitting in the control couch, there lots of specific terms for directions relative to the pilot, which can be found here. For absolute positions within a solar system, you'd probably use some kind of spherical celestial coordinate system, centered on the primary star, with the fundamental plane set to the primary's ecliptic (in other words: a heliocentric ecliptic coordinate system). The zero point of the ecliptic longitude is at the vernal equinox of the Northern Hemisphere, traditionally known as "The First Point of Aries". For a quick jargon, longitude can be divided into 12 segments of thirty degrees each, named after the signs of the Zodiac. In the novel Phase Two, relative angular longitude measurement between two points is done in terms of "months", with one month equal to thirty degrees. This is related to the amount of time it takes Earth to travel thirty degrees around its orbit. 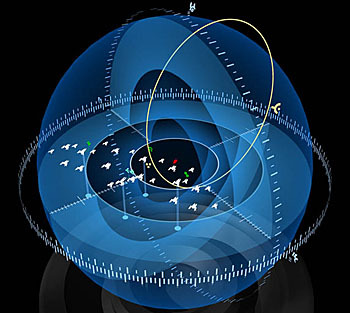 Space maps displaying the positions of local spacecraft are traditionally (in science fiction at least) shown in holographic spheres. 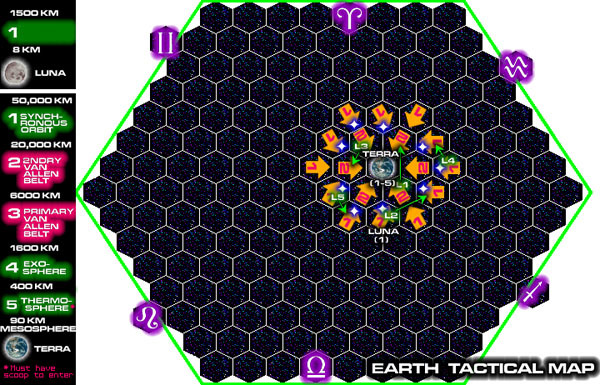 Sky marshals will use a display based on absolute celestial coordinates as they control the strategy and tactics of a battle (center = primar star, zero longitude = vernal equinox or galactic center). Combat starships in the thick of a fight, on the other hand, will probably use a display based on coordinates relative to the ship in question (center = ship, zero longitude = current position of ship's nose). My re-do of a tactical map from the game Rocket Flight. The edges of the map are labeled with the signs of the zodiac denoting the ecliptic longitude. But you're going in the wrong direction. A.T. headquarters is in King sector, about five months from Belt City." "Five months?" Paulsen laughed this time; a free laugh. "Oh, that's orbital distance, not the time it would take to get there. It's a Beltish system of direction. We use Earth's orbital velocity as the standard of distance for an asteroid—the way you use a clock face as the standard of position for an airplane; or a globe of Earth for the standard of reference in a spaceship. "But that wouldn't do you any good in a spaceship. Which way's up ? The way you 're facing or the way you're going? And are you in an acceleration couch lying down, or a couch-chair like ours? But— well, you've got the 3-D Plan Position Indicator. It's f a globe. You use it like a globe of Earth for your reference." "But an asteroid—well, A.T. is in a position that puts it in line with a spot on Earth's orbit that's five months Earth speed further along that orbit than Belt City. So they're five months apart." "Sure. It's easy once you think about it. Makes sense." "Then there's the other part, the sectors. They're named like a deck of cards—ace, king, queen, jack, ten. The Belt's not evenly spaced around its orbit, you know. It sort of divides up into five sectors, with a fair amount of fairly empty space between. So you've got the sectors to contend with too. Think you can manage?" Erik Max Francis has created a powerfully compelling measurement system based on fundamental Planck units. Well, in reality he said it was not particularly revolutionary, he just did the multiplication, and actually using it would be extraordinarily silly. But for science-fictional purposes, it is far more scientifically accurate than using centons and yarens. 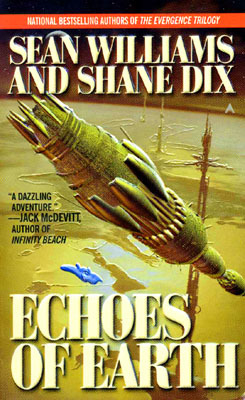 The system was modified by Sean Williams and Shane Dix for use in their "Orphans" novels. In physics, there are five universal physical constants: speed of light in vacuum, Gravitational constant, Dirac's constant or "reduced Planck's constant", Coulomb force constant, and Boltzmann constant. Planck units are units that are defined in such a way that if you express any of the five universal constants in terms of Planck units, their value is "one." Planck units are pretty much standard when doing relativity theory, and have been since at least about the 1970's (at least, Misner, Thorne, and Weaver discuss Planck units in their classic textbook "Gravitation"). A related idea is atomic units, where the electric charge, the quantum of action (Planck's constant h-bar) and the electron mass are set equal to unity, creating a system where the fundamental length scale is the Bohr radius of hydrogen and the fundamental energy scale is twice the binding energy of the hydrogen atom in its ground state (I work with these units a lot for my real job). In this system, the speed of light is equal to one over the fine structure constant (c ~ 137, alpha ~ 1/137). It is a very convenient system of units for performing calculations in solid state, condensed matter, and atomic physics. There are five Planck units: Planck length, Planck mass, Planck time, Planck charge and Planck temperature. For his system Mr. Francis only needs the first three. Another issue that is quietly not mentioned anywhere that I'm aware of is that the Planck constant is not really known to sufficient precision to base a system of units on it. A measurement system needs a set of fundamental units, from which all the other units can be derived. For his system Mr. Francis used the SI fundamental units: length, mass, time, electric current, thermodynamic temperature, luminous intensity, and amount of substance. For length, mass, and time units just use the Planck units directly. For electric current (charge divided by time), use the (unit independent) magnitude of the charge on an electron for charge, and Planck time for time. For thermodynamic temperature, it can be derived with the Boltzmann constant. The Boltzmann constant is equal to energy divided by temperature, so simple algebra will give you the equation: temperature equals energy divided by Boltzmann constant. For the energy unit see below. Luminous intensity is tricky, see Mr. Francis' essay for his solution. Again, for details about the units derived from the fundamental units, refer to the essay. Any unit not defined is left as an exercise for the reader. Mr. Francis doesn't approve of such alternate metrification in principle. He is, however, quick to say that he is not talking about Sean Williams and Shane Dix. What he is annoyed at is some people who want to actually propose alternate second-minute-hour-type systems to replace the existing SI unit system in the real world (which of course, is not at all what Mr. Williams and Mr. Dix were doing). It's a weird mishmash of the raw Planck units — which are essentially so awkward as to be totally unusable — and a reformulation of different (non-metric) multiples of "new" units like "new hours" in order to refit them into roles that are vaguely like what the old ones were, but with the values slightly different so that they're metric... but not really. For instance, there are 100 new seconds in a new minute, 100 new minutes in a new hour, 20 new hours in a new day, 5 new days in a new week, 6 new weeks in a new month, and 10 new months in a new year. The whole point of a metric system is that the ratios are powers of ten, and especially when you're dealing with modern metric systems like SI, a primary goal is that the unit system is coherent, meaning that the conversion factors between different units are unity. More generally, I very strongly believe that any alternative unit system should not reference old names for non-metric divisions like "hour." This will only lead to confusion, and without much use. If you're talking about time systems in other local environments where the days and years are of different lengths, then this adds a new layer of confusion because now you have to figure out whether they mean Earth hours or Epsilon Eridani IV hours. Truth be told, I think the executive summary is that having a coherent, metric system of units with reasonable base units for a wide range of endeavors is the goal. And we already have that in SI. Any modifications to that system seem to be only to be done for flair and not for any good purpose. Not that (15 pieces of) flair is a bad thing, but often, it seems, when people come up with neat alternative unit systems for the sole purpose of coming up with neat alternative unit systems, they kind of miss the point and makes ones that are qualitatively worse than SI. As previously mentioned, this system was adapted by Sean Williams and Shane Dix for their "Orphans" novels. The authors state that they have adapted Mr. Francis' ideas to suit their needs, and any errors introduced in the process are theirs. Sean Williams and Shane Dix postulate the new system was adopted in the wake of even more disasters like the Mars Climate Orbiter fiasco. That was caused due to the fact that Lockheed Martin used English units while NASA (like the rest of the civilized world) uses Metric units. Everybody just assumed they were all using the same units, and didn't discover differently until the probe ricocheted off the Martian atmosphere. This sent the probe off into oblivion and $125 million dollars down the drain. In the novels, Mr. Francis's system is modified somewhat. The Planck units are fundamental, but have exceedingly inconvenient sizes. One inch is about 157 billion quadrillion quadrillion Planck meters, an average person masses almost three trillion Planck kilograms, one hour is equal to about a trillion quadrillion quadrillion quadrillion Planck minutes. So they scaled the Planck units, multiplying them by 1043. This makes the units more human sized. The distance units were chosen to be sort of a compromise between the old Metric and the old English units, since in the novel the US was still stubbornly and idiotically sticking to English. The new centimeter was between the old centimeter and the inch. The old mile and the old gallon was very close to the new kilometer and new liter. The jingle in the US was "five old pounds equal one new kilogram". Many commonly used constants have simple values when expressed in Adjusted Planck Units. The following conversion factors will convert from the old International System of Units to the new Adjusted Planck Standard International Units. Natural units are physical units of measurement based only on universal physical constants, with each set to a value of 1. The Planck system is such a system. While such a system may seem pedantic, it has applications to communicating with extraterrestrials. They ain't gonna use the metric system, that's for sure. For instance, the metre is defined as the distance traveled by light during a time interval of 1/299,792,458 second. That weird number is based on 1,650,763.73 wavelengths of the orange-red emission line of krypton-86. Which was based on the length of a physical prototype metre bar. Which was based a distance equal to one ten-millionth of the distance between the North Pole and the Equator. The point being that an alien species is not going to be living on a planet with precisely the same size as Terra, and even if they did 1/ten-millionth is probably not a special number in whatever radix they use. Natural units on the other hand are much more universal. In physics, natural units are physical units of measurement based only on universal physical constants. For example, the elementary charge e is a natural unit of electric charge, and the speed of light c is a natural unit of speed. A purely natural system of units has all of its units defined in this way, and usually such that the numerical values of the selected physical constants in terms of these units are exactly dimensionless 1. These constants are then typically omitted from mathematical expressions of physical laws, and while this has the apparent advantage of simplicity, it may entail a loss of clarity due to the loss of information for dimensional analysis. It precludes the interpretation of an expression in terms of fundamental physical constants, such e and c, unless it is known which units (in dimensionful units) the expression is supposed to have. In this case, the reinsertion of the correct powers of e, c, etc., can be uniquely determined. Unit of thrust equal to 0.05 Newtons, approximate amount of thrust generated by an average hummingbird. Useful for measuring the disappointing thrust levels of ion drives and other low-thrust/high-specific-impulse propulsion systems. For instance the NSTAR ion drive used by the DAWN mission had a thrust of about 1.8 hummingbirds. Invented by RocketCat. Unit of acceleration equal to 0.008 meters/sec2, approximate amount of acceleration generated by an average snail. For instance the DAWN mission had an initial acceleration of about 0.00837 snails. Invented by RocketCat. Unit of damage inflicted by spacecraft weapons. Warships typically have weapons rated in "megahurts". BAHdum chinnnng!. Invented by Douglas Adams in The Hitch-Hiker's Guide To The Galaxy. 1 BED is equal to 0.1 µSievert (or 10-7 Sv). This is the amount of radiation a person is exposed to by eating one average-sized banana, due to the naturally occuring potassium-40. There is a helpful chart here relating various types of radiation exposure to banana eating. Amount of facial beauty required to launch one-thousand ships. Therefore 1 milli-Helen is the amount of beauty required to launch one ship. Negative Helens are the amount of facial ugliness required to beach ships. Prefix meaning "a large number" or "Billions and Billions". At least four billion (two billion plus two billion). 1 Elephant is a rocket propellant mass flow rate of 5,000 kilograms per second, where 5,000 kg is the mass of an average elephant. So a Saturn V rocket at lift-off is expending about 3 elephants per second. Unit was proposed by Maxim Sachs and refined by Kyle Hill. Unit of work performed incorrectly. Invented by Tom Weller in Science Made Stupid.